I’ve always had a weakness for fresh figs. When fully ripe, their flavor is absolutely sumptuous. Figs are exquisite in desserts or simply eaten on their own, but they’re equally at home with savory foods, like these crostini. 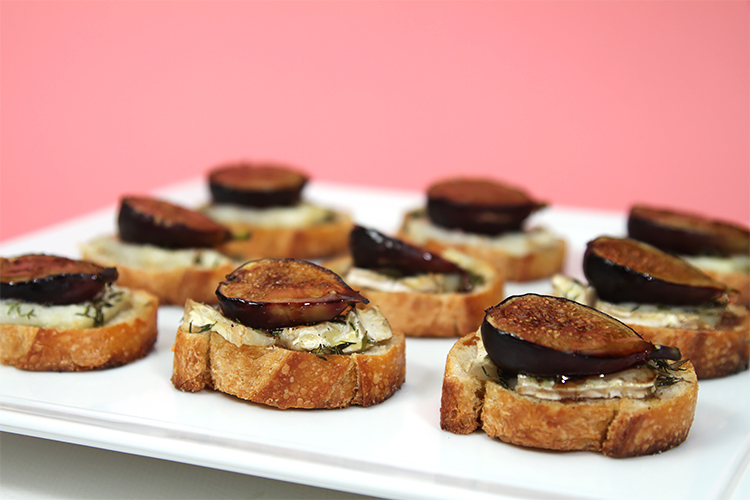 The contrast of the sweet figs with the pungent semi-aged goat cheese is sublime – an addictive finger food! As a last touch, the figs are brushed with aged balsamic, just before the crostini are baked. The balsamic glazes the fruits and intensifies their fresh-fig flavor even more. Who could resist taking a bite? A rosé sparkling wine is utterly delicious with these crostini – look no further! Step 1: Brush the baguette slices with a little olive oil. Place them oiled-side-down on a baking sheet. Place a thin slice of the goat cheese on the un-oiled side. Dab the cheese and the bread with a little olive oil, reserving about 1 teaspoon. Sprinkle with the salt, pepper and thyme leaves. Top each crostino with a fig half, cut-side-up. Cook’s note: The crostini can be made up to this point 4 hours ahead. Cover with plastic wrap and keep in a cool place or refrigerate until ready to bake. Step 2: Add the balsamic to the reserved olive oil, mix well and brush the figs. Bake for 8 to 10 minutes until the crostini are golden around the edges. Remove from oven, place on a serving platter and serve immediately. These crostini are also incredibly delicious with blue cheese. Try a Stilton, gorgonzola, Bleu d’Auvergne or Jasper Hill Farm’s exquisite Bayley Hazen Blue. These sound delicious, what type of wine or cocktail did you serve with them? 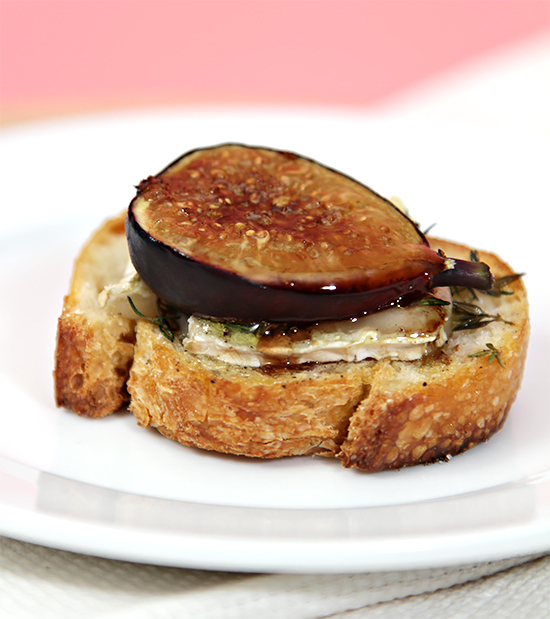 Alyssa, a sparkling rosé would be beautiful with these fig crostini. I can hardly wait for fig season to begin… Cheers! Figs, I love them. When I was a young girl we had a fig tree and I could eat all the figs I wanted. I’ll give your recipe a try it looks delicious! Thank you! 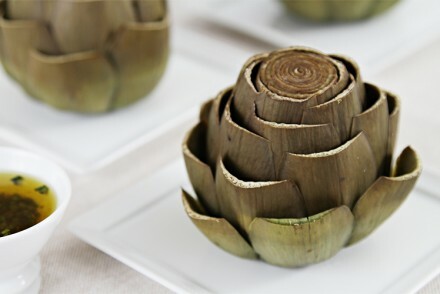 Viviane, these look wonderful, and I’m going to try them for a dinner party on Tuesday. Now — are they standing around with a glass of bubbly appetizers or sitting at the table with a knife and fork and napkin appetizers? Can’t wait — I know they’ll be wonderful! Hi Julie! I think they do best when passed around with a glass of bubbly – finger food type thing. Let me know how they turn out! 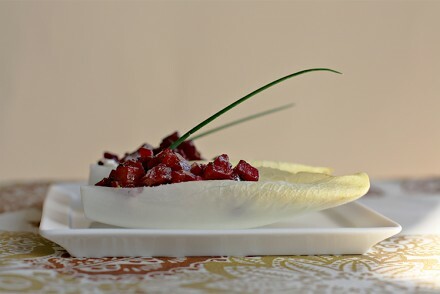 I love figs too – how unusual your appetizer is. Dear Demetra! Thank you for your wonderful comment. Yes, thyme you’ve dried yourself does count for something… a lot of “something” in fact! I am glad you enjoyed the fig crostini and I hope that in the not too distant future you’ll try them again with bûcheron and fresh thyme. It’s the choice of ingredients that makes a recipe stand out… It’s funny how that works. I’m stocking up on figs for the next couple of weeks as I’m not ready to give them up yet! Until this weekend I thought that my love of figs couldn’t be stronger than what it was. Wrong! I was dying to wait until I got Bucheron as I thought it would be brilliant but the figs in my refrigerator were begging to be tried out in this recipe. To make matters worse I didn’t have any fresh thyme (although the I picked and dried the thyme I do have, so I thought that counted for something!). Despite these issues I made them this weekend and I have to say that this recipe is BRILLIANT. I used an aged Greek cheese that I had on hand and, yes, it was all I could not to eat the entire pan. Yes, yes, you warned us. And indeed you were right. I can only imagine that making this exactly as you’ve instructed would be completely over the top. 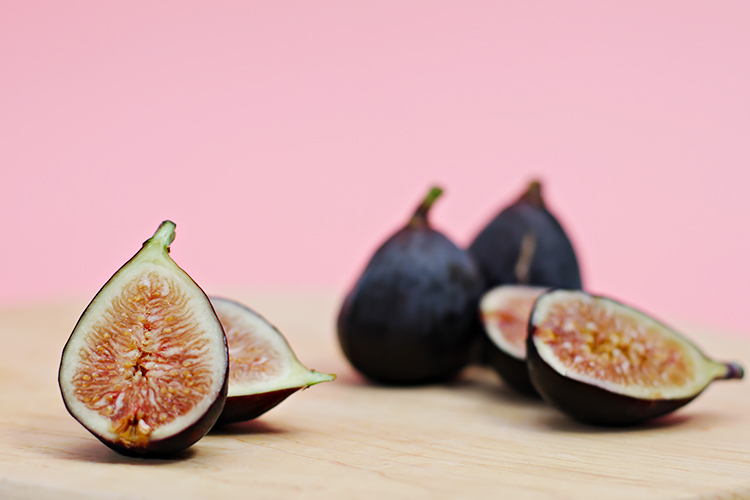 I doubt that I will ever have a dinner party during fig season without these on the menu, seriously. And now I’m doubly wistful about figs going out of season! 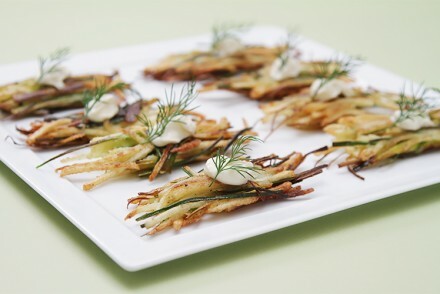 These look fantastic for a dinner party or just a snack! Yum! This makes a fantastic appetizer. I really enjoy pairing figs with cheese. 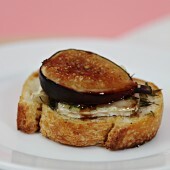 We had a blend of figs and goat cheese the other night at a friend’s supper club. It was both sweet and savory. Look forward to giving your recipe a try. I’m grabbing some figs at the market tomorrow JUST to replicate this dish. greatness! How easy would it be to polish off a whole platter of these? I definitely would not be able to resist these! They look perfect with the balsamic! Meghan… I totally agree. Resistance is futile. I can eat an entire of trays of these all by myself! This looks great–I just need to figure out what cheese to use since I don’t have a lot of access to fabulous European cheeses. Hi Cucina49, Thank you for stopping by… You could use fresh goat cheese instead of the bûcheron although you will loose a bit of the flavor… Also, look at “Viviane’s Tip” at the end of the recipe: blue cheese will give you that delicious contrast and salty bite. Bon appétit! Ooh, this is absolutely stunning! Sweet fig and creamy cheese? Oh, yes, please!